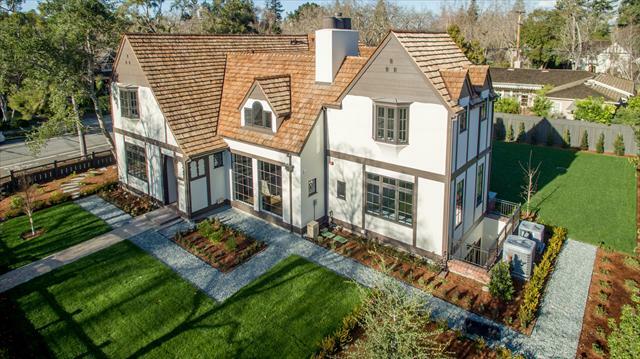 Nestled on a tree-lined street in coveted Old Palo Alto, 2203 South Court stands as a pinnacle of masterful design, with impeccable custom finishes and gilt-edged amenities inside and out. Conceived by award-winning developer Hazel.Wood, the residence is infused with clean and modern elements throughout, always with a nod to the traditional. •Carved wood front door opening to the entry with built-in coat closet. •Front sitting room with peaked two-story open ceiling with exposed wood beams. Features include a glass-front gas fireplace in a carved wood setting, floor-to-ceiling picture windows overlooking the front yard, and folding glass doors opening to the backyard. •Dining room with a built-in recessed hutch, window alcove, and box ceiling. •Kitchen featuring a La Cornue Chateau 120 limited edition range with four gas burners, French plaque top, and hood; Sub-Zero refrigerator; Miele oven and coffee/cappuccino maker; Calacatta marble counters; ample cupboards and drawers with soft close feature; cement tile floor; an open beam ceiling. A wood center island includes a Shaws farmhouse sink, Bosch dishwasher, and countertop dining area with lantern-style lights above. Set in an arched walkway from the kitchen to the dining room, the caterer prep room includes cupboard storage and glass-front door to pantry with built-in shelves. •Family room open to the kitchen offering folding glass doors to the backyard. •Den suite with built-in floor to ceiling bookshelves, built-in desk overlooking front yard, and double glass doors opening to the backyard. En suite bathroom with subway tile shower. •Master bedroom suite with peaked ceiling and two walk-in closets with built-ins. A freestanding tub serves as the centerpiece of the breathtaking en suite bathroom featuring a dual-sink marble vanity, large steam shower, and separate facilities. •Walkway framed by bookshelves and overlooking the living room below leads to the second top-floor bedroom suite featuring glass-paned doors to a private balcony overlooking backyard. Additional features include a bay window, walk-in closet, and en suite bathroom with subway tile shower. •Two additional bedrooms, one with built-in bookshelves and a walk-in closet. •Hall bathroom with full tub. •Huge bonus room featuring a custom glass-enclosed wine cellar and a kitchen with a temperature controlled wine refrigerator and countertop bar area. Glass-paned doors from the bonus room open to a sunken patio. •Two bedroom suites, one with a walk-in closet. Both bedrooms include doors to a private sunken patio and en suite bathrooms with subway tile showers. •Large laundry room with LG washer and dryer, farm sink, and ample cabinet space. Additional home features include an integrated Sonos sound system, two air conditioner units, a home alarm system, and an automatic gate opening to the one-car garage. The approximately 5,309 square foot lot is only blocks from downtown California Avenue as well as being close to the numerous dining and shopping options of University Avenue. Set near Oregon Expressway with easy commute access via 101, and offering close proximity to sought-after Palo Alto schools and Stanford University.